It was a beautiful, sunny afternoon in Brookshire Meadows. The birds were chirping and a pleasant breeze was rustling through the trees, and the occasional soft, fluffy cloud drifted with the high-altitude winds in the perfect blue sky. It was a lazy Sunday, and there was barely a car on the road. Last edited by RockstarRaccoon on Wed Jun 02, 2010 6:39 pm, edited 2 times in total. "I'm going out now!" Cale yelled as he grabbed his board running out the front door. He dropped his skate board to the ground, getting onto it before taking off down his driveway and into the streets. As he sped down onwards he looked around and enjoyed the nice weather, listening to nature's music. Rocky was starving. He had walked through numerous neighborhoods looking for a bite to eat when he came to some neighborhood called "Brookshire Meadows". It had been 4 days since the airport incident and he wondered if he had did the right thing. He walked a little off to the right of the sidewalk so that he wouldn't get in the way of normal pets, because most that he had past in previous neighborhoods had been mean to him. he looked at all the Beautiful houses, and wondered what they looked like inside. As he looked up at the birds and squirrels in the trees, he saw that even they had a home. Kyra looked outside at the new yard through the car window. Not nearly as cramped as an apartment, she figured. Seeing as how there was nothing inside anyway, she took her book and found a nearby tree. She sat down under it, yawned, and started on her book. Actually, ended it. She wasn't sitting down for more than 15 minutes before she was done, so she decided to walk around for a while. Cale was zooming down the sidewalk when he saw a figure appear ahead of him. He slowed down and came to a stop next a husky. "You new to the neighborhood?" Rikki draped lazily back on a tree in the housing development. He liked having a reliable source to feed his needs and wants, but it was times like these he wondered what pets did all day: he'd pretty much just woke up, walked a few miles, then lied back down in a new position. Foraging for food and hunting down rodents was at least a way to keep occupied, but now he just let little songs and ideas entertain him as they ran through his head. As he pondered his lack of entertainment, he noticed a white dog walking on the sidewalk near him: a possible source of entertainment. "Yo dog! What's up?" He yelled to it, sitting up in his perch, grinning at his own bad pun. Last edited by RockstarRaccoon on Mon May 31, 2010 10:00 pm, edited 2 times in total. Rocky was deep in thought when he heard something. He looked up to see a cat riding straight toward him. He was suprised that he stopped near him. "Umm... Yeah? Yeah... I guess you could say that" Rockys ears were down as he was expecting to be hit by something soon. Kyra kept walking by the tree a couple of steps, paused, and turned around to see a raccoon sitting in one of the trees. "Me? Not much, really. Are you a pet here, too, or feral?" She was oblivious to the pun. "Welcome to the neighborhood, I'm Cale." He stepped off of his board, stomping on the back end to make it jump into the air before catching it in his left arm. "Do you like it here so far?" Rikki jingled the official looking tag on his collar with two of his claws, "I live with the local ranger." he replied, in his typical grainy voice, "I take it you're a new house-pet around here?" "Yup. Moved here, partly anyway, today." She looked around. "Why would a ranger's pet be out here, anyway?" "yeah... " Rocky quickly jumped back when the cat flipped the skateboard up. He looked around before asking quietly "d-do you have any food?" Rocky braced for impact. "Well, Jack's busy doing paperwork, and his deputy's taking the day off, so I had nothing to do when I woke up. I figured 'hey, maybe I can find something interesting in the housing area.' And so I did!" he jumps down with the last statement, landing squarely on his toes, ending the statement by opening his arms, as if to present this new dog as a prize. "My name's Rikki by the way. Should I just call you 'dog', or do you have a better name?" "My name's Kyra, and if you're gonna call me 'dog', I'm calling you 'raccoon', er, Rikki." She didn't feel like asking who "Jack" was, in fact, she was still trying to figure out Rikki. Frank sang to himself as he strolled down the street. "Fly me to the moooon, let me plaayyyyyy among the staarrrrsss..." he sang quietly, "Let me see what spring is like on-" *jump, skip* "- a-Jupiter and Maarrs...."
Up ahead he saw Cal and Rocky, though he, of course, didn't actually know their names. "Hey neighbors! What's shaking?" he hollered energetically increasing his stroll to a jog to talk to said neighbors (well, neighbor and one stray, but you get the idea). "Oh, just a book I was reading. Well, several of them, I guess." She shows the reading book, nearly the size of a high-school textbook, which is labeled "For ages 13-18". "It gets boring after a while, but it's better than reading the manuals on the engine, I guess. It has, I think, 3 or 4 novels in it." Cale was taken aback by the dog's sudden question. "Well yea, at my house I do. If you want you can come over and-" Just then a blue cat hollered over to them, jogging their way. "Oh hey, you new to the neighborhood too?" Rikki glares into the cover of the book, his head tilted, and begins to sound out the words on the cover. "Let's see... Lord.... Of... The... Rrr... Rings! 'Lord of the Rings'. That sounds interesting... Are the pictures good?" "Oh, sorry, were you in conversation?" asked Frank sheepishly, "I kinda acted on impulse there. The name's Frank. Frank Holiday. I'm new here too. Who're you guys?" "I'm assuming you don't know? You're lucky if you see more than, I dunno, 5 pictures per story. In this one, they're all wither sketch-like or, at least, just compliment the novel itself. However, they are very well drawn out." Kyra wonders if Rikki usually reads, but the way he sounded out the words doesn't exactly prove her thoughts. This also makes her wonder if she would be called a book nerd for reading so much. Although before, she never dealt with that, as she had some friends before who read as much as her where she previously lived. Rikki looks up from the cover with mild surprise, "you... you can read all that? I heard pets could usually read, but that looks like alot...." He tilts his head, looking down at the book, and back up at Kyra. <atarii> "Well, my mom is an English teacher. So, she taught me most of it. It's not like I can understand it all, but what I can't, I just skip over. It's better than learning how to do something else, as this has some kind of action to it." Kyra shrugged." <RockstarRaccoon> Rikki tilts his head the other way, and says thoughtfully "Jack taught me how to read, but just important things like "Danger" and "First Aid" and "Poison", and how to sound out the words and callsigns on the alert box, but I've never read anything like that... is it like, stories about stuff that happened?" <atarii> "Kinda. It depends, it can be what happened, what never happened but is entertaining to read, and what people predict or think may happen. In these, they're just entertaining, but this story never happened." She tried to put it into a way that Rikki could understand, but didn't think she managed to. <RockstarRaccoon> "So.... So like a Folk-Tale?" Rikki asks, putting it in words he can understand, being clever and wizened enough, "What's it about?" <atarii> Kyra couldn't think of how to fit the plot into enough that she wouldn't have to say the equivalent of a book. "Er, well, the problem with this is that in order to do that, you would have to read it, as the characters are actually created with the story. So, If I tell you about Mordor, you can't really assume what it is, right?" Kyra got a headache from trying to explain this. <atarii> She'd never been able to simplify something, as it made it sound compressed and incomplete, so she would lengthen it, but it would be incomplete, and the "loop" was enough to make her unable to explain it. <RockstarRaccoon> "...Mordor... That sonds like this place I heard of one time which had mountains that spewed fire and molten rock, and there was an evil sorceror, and these two little Mice had to take his magic acorn to a mountain and throw it in to stop him from destroying the world, or something like that..."
<atarii> Kyra blinks in surprise. "Th-that's what Mordor is, well, almost, anyway. I mean, at least you know about it, even a little, right?" <RockstarRaccoon> "I heard it from a friend who heard it from a pet once... He never got a chance to tell me the rest..."
<atarii> "Huh." Kyra starts thinking to herself. Maybe she isn't the only one who read a lot. Then in that case, "I might not be a book nerd!" She says out loud, nearly yelling it. 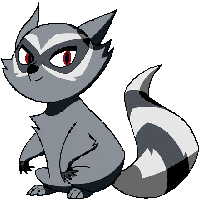 She looks around, and notices Rikki still nearby. "Oops, started thinking out loud, I guess." <RockstarRaccoon> "a.... 'book nerd'? What's a 'book nerd'?" <atarii> "As you can figure, I read books a lot. I guess usually people would say something like 'bookworm', maybe? But it's just that compared to others, I might look like a 'book nerd', and although I guess it's not bad, it'd make things awkward for people to not know what you're talking about." <RockstarRaccoon> "So... You read books alot?" <atarii> "Yeah. It's usually to occupy spare time, though." <RockstarRaccoon> "...Can... Can you teach me how to read like that?" <atarii> "I can try to teach, although you'll have to remember that I haven't taught, so you might have to bear with me sometimes." Kyra thinks it'll be kind of cool to be akind of tutor, even if she hasn't taught before. <RockstarRaccoon> "Really?!" Rikki perks up excitedly, and rushes to Kyra's side "Can we start right now?" <atarii> "Eh, sure." Kyra didn't know what to start with, so she decided to get some textbooks that she found simple enough at home, hopefully already unpacked. "I'll have to see if I can get some books at home, wanna come along?" <RockstarRaccoon> Rikki stopped for a second... "...um, ok, let's go then." <atarii> Kyra managed to find her way back, and looked around for books. She found an old 1st grade reading textbook, and looked in it. The stories were so easy to read, but they also had pronunciations to them. She chose the first one, which was a "Pre-Assessment", and gave it to Rikki. <atarii> "See how much you can read," she said. <RockstarRaccoon> Rikki began to sound out the words, slowly but surely "The... I don't know that one... Brown... Fox, hey, I like foxes. Jumped.... over the... luh... Lazy. The lazy Dog. The something Brown fox jumped over the lazy Dog." he finished proudly. <atarii> "That was really good! Only one word wrong." <RockstarRaccoon> "What was the word?" <atarii> "The word? It was 'quick'." Rikki looked down at the page, making a mental note, as if the sentence was some sort of formal affair "Quick. Got it.". "I'm Cale, and this is... I don't think you told me your name." Cale says looking over at the Husky. Rocky was taken aback. no one has ever asked his name, usually people hit him or laugh at him and walk away. "Hey there Rocky!" Frank responded with a wink n' a smile. He stopped and frowned suddenly. "Hey, you okay, Rocky? You seem kinda... I dunno. Sad about something?" "well... Yeah i guess so.." Rocky put his head down. "It- its nothing. dont worry about it." He turned back to Cale to hear the rest of where some food is. "Well it's nice to meet you dude but me and Rocky were going to go back to my place." Cale dropped his board onto the ground, getting onto it and slowly took off down the sidewalk. "Come on bro" Cale says motioning to Rocky. He started running behind Cale. Running was a familiar thing to him, for 3 years of his life he was in a training camp to become a sleigh dog, which brought up most of his strength, stamina and a few other things, but because he was not schooled there it brought down some mental characteristics. But still he got the nagging feeling inside him that something was not right. Someone couldn't be that nice to him by just meeting him a few minutes ago. "Right. See you," said Frank, perturbed. He could've sworn that Husky was unhappy over something. Something didn't feel right, but he couldn't describe it. Frank made a decision. "Time for Operation Creepy Stalking!! ONWARD!! FOR GREAT JUSTICE!!!" With a energetic bound, he leaped into a nearby hedge. After a few minutes Cale reached his driveway where he hopped off his board, picking it up as he walked to the front door. He turned back and looked at Rocky,"We just finished eating, I'm sure mom hasn't put up the left overs yet. Do you like Tuna casserole?" Frank panted. Jeez, those dogs ran fast. He peered through the hedge and watched as Cale and Rocky conversed in the driveway. Hmmmm.... Yes, Frank was sure that Rocky had some sort of emotional baggage. Frank had no idea how he'd missed it before, but Rocky's posture definitely had the look of a pet who'd been abused by his owner. He'd seen plenty of those cats and dogs in the alleys of Chicago. Some were paranoid, others were timid, but all were constantly on the defense. "What two-faced saggy left rat buttock would do that in THIS neighborhood though?" Frank muttered to himself. "Must continue observing!" He creeped out of the hedge and plastered himself to a wall facing away from Cale and Rocky and eavesdropped. Rocky remembered they served tuna casserole every thanksgiving at the training camp. "Do i ever!" Rocky's mouth was watering by now. Finally something to eat. He followed Cale. Frank peered around the corner. That seemed to be an... exuberant reaction to Tuna Casserole. On the other hand, he acted the same way toward Spaghetti and Meatballs. "Must continue research! Onward!" Unless he didn't know pets at all, most ate in the kitchen. Theoretically, they'd head in that direction. He ran off for the kitchen. Luckily, the window was open to catch the evening breeze. If they DID come in here, he'd hear every word perfectly. Cale opened the front door and walked inside. "Mom! our new neighbor is hungry, can he get some of the left overs from earlier?" Cale yelled into the house. "Just a second" Mrs. Patterson called back. She walked to the front door seeing Cale and the Rocky. "Hello and welcome to the neighborhood! ""Mom this is Rocky, can he get a bite to eat?" Of course, you must be hungry from the long drive all day. I hope you like Tuna casserole, it's my specialty! Cale followed his Mom to the dinning room table. Rocky followed Cale into the dining room, looking around the inside of the house as he went. "yes ma'm i love it." So this is what a house looks like from the inside. Rocky thought to himself. Frank gulped. The window wasn't that far up, but he wasn't sure he could get in without making an unholy racket. Especially if the sink was under the window. Ah screw it. The worst that could happen was that he would get caught. And even then, he would just say that he smelled Tuna and wanted some and thought nobody was home and please forgive a hungry cat for going after what cats like most (insert puppy dog eyes here)? He faceplanted on the floor. "Have a seat boys and I'll go heat up some Casserole for you Rocky." Mrs.Patterson walked to the kitchen. Cale took a seat at the table, indicating for Rocky to sit as well. Mrs.Patterson entered the kitchen and saw Frank looking in through the window. "You must be new to the neighborhood too, did the smell from my tuna casserole draw you here?" She asked smiling, taking pride in her special dish. Rocky sat down at the table as he heard the crash, but he soon forgot about it as he smelled the tuna in the air. "So- I, is this your house?" Frank gulped as he fell. Just his luck, the lady of the house would come walking in as he faceplanted. Time to turn on the old charm. "Ah, my apologies madame," he said as he picked himself up. "My name's Frank Holdiay. You are correct, it was the quintessential aroma of what I imagine must be the most wonderful, most heavenly Tuna Casserole in the history of the Universe." He took a big sniff for emphasis. "In fact, even though I just had dinner, would you terribly mind if I had some? I'm afraid that the utter deliciousness that is present in the air is making me hungry all over again." Cale heard the loud thump, but ignored it as his mom was rather clumsy so it was common to hear her drop something. "Yea this is our house, I've been living here ever since i was adopted as a kitten." Mrs.Patterson couldn't help but giggle with joy from the compliments that Frank was saying. "Of course you can have some. There is another new neighbor in the dinning room who is going to have some as well. Why don't you go join them while I get it ready, you can all get to know one another!